Last night the Town of Herndon held a public hearing on the Herndon Metrorail Station Area Plan. Several residents spoke about the need for good multimodal access to the future Herndon Metro Station. One speaker noted that Reston Town Center and Manhattan aren't clogged with traffic all of the time because of their design; the grid streets and mix of uses give people reasons to walk and bike there instead of driving. A cycle track along Herndon Parkway is included in the plans. You can comment or send suggestions on the plans. Visit the project website for more information. Approximately 16 citizens testified last night at the public hearing on transportation projects in Virginia. Only 3 of 17 members of the Commonwealth Transportation Board were present, Thelma Drake, Director of the Department of Rail and Public Transportation, Douglas Koelemay the Northern Virginia District rep and Gary Garczynski the At-Large Urban rep.
More than half of the speakers wanted better bicycle, pedestrian, and transit solutions. Roger Deitrick and David Dixon of the Sierra Club testified as did Fionnuala Quinn and myself from FABB, Pat Turner of BikeLoudoun, and Jenifer Madden of the Tysons Metrorail Station Access Management team. Chairman Bulova, Supervisor McKay and several other speakers stressed the need to fund Tysons access projects, including those in the Tysons Bicycle Master Plan. Folks from the car lobby once again advocated for the sprawl-inducing outer beltway. With our current system badly in need of maintenance funds they and their developer supporters want to build a new north south highway to feed new development in Loudoun County. Carol Welty of the Washington Airports Task Force even advocated for a 6-8 lane freeway circling Dulles airport. Bob Chase of Northern Virginia Transportation Alliance has been the biggest booster of the outer beltway, including a new crossing of the Potomac into Montgomery Co.
See our complete testimony on the Six-Year Improvement Program. See also Greater Greater Washington's excellent summary of the CTB's reversal of having connected neighborhood streets that was the subject several speaker's comments last night: Virginia turns back toward the 1950s by weakening road connection standards, neglecting populated areas. Update: See coverage of the meeting in Vienna Patch: NOVA Weighs In On Allocation of VDOT Transportation Funds. The Post has an article today entitled Tight money, looser constraints? With the transportation budget stretched, Congress may jettison mandates that have guided funds to bike paths and walkways. 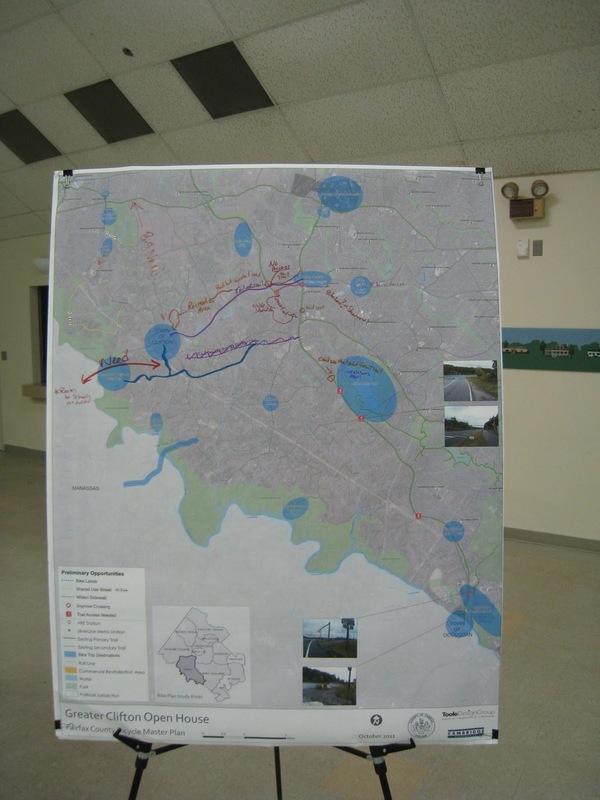 The Transportation Enhancement program funds projects such as rail-trails like the W&OD trail. Back in 2007 and 2009 Senator Coburn tried to cut TE funding, each year getting more votes in favor of gutting the program. In 2009 Virginia's Senator Webb vote for the cuts. This year the Six-Year Improvement Program public hearings are being billed as a chance to "Comment on Multimodal Transportation Investments, Your Transportation Dollars at Work." The meeting will be held at VDOT Northern Virginia District Office 4975 Alliance Drive, Fairfax, VA 22030. 6-6:30 p.m, Open House, 6:30 Moderated public meeting. This is a chance to tell the Commonwealth Transportation Board (CTB) how you think they should be spending our transportation dollars. The car lobby will be there to promote spending more money on the "I-66 corridor (inside and outside the Beltway), the Bi-County and Tri-County Parkways, [widening] Routes 1, 7, 9 and 15, as well as new Potomac River bridges." We'll be asking for more funds to improve bike conditions in Northern Virginia, including funding the recommendations of the Tysons Bicycle Master Plan, improved maintenance, implementing the Bicycle Policy Plan, and providing bike facilities on major roads that cyclists are forced to use since our neighborhoods don't connect. It would be good for the CTB to hear from some new voices. 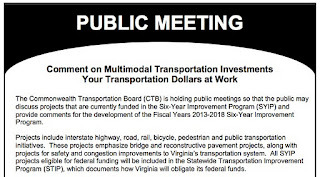 If you can't attend the meeting, you can send comments to Six-YearProgram@VDOT.Virginia.Gov. You can see all Fairfax projects in the plan by visiting the Six-Year Plan database, selecting District: Northern Virginia and Jurisdiction: Fairfax County. 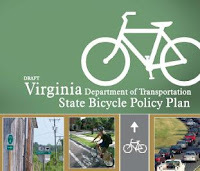 Today VDOT announced the publication of the Virginia State Bicycle Policy Plan. The plan has been in draft form for over a year, a time in which there was no bike coordinator. One result of hiring John Bolecek as the new bike coordinator is that final work on the plan could be completed. FABB provided extensive comments on the plan in September 2010. Most of our comments were included in the final draft. The Policy for Integrating Bicycle and Pedestrian Accommodations was adopted in 2004. It ensures that bicycle facilities are included in the planning and implementation of all future projects (with exceptions). The new policy plan provides better guidance to ensure implementation of the 2004 policy. However, further guidance is needed to determine the appropriate type or level of bicycle accommodation that may be needed in different roadway environments. This is a particular issue for large suburban roadways because land use changes due to development create an even greater need for non-motorized transportation accommodations and safety countermeasures. This should include strategies to ensure that piecemeal development results in bicycle facilities that are contiguous and functional in both the short- and long-term, see example policies and procedures in Appendix A. During road construction and rehabilitation projects, VDOT will investigate nearby bicycle facility connections and make all reasonable attempts to close gaps and facilitate transitions between different bikeway types. This has not been the case in the past. FABB worked with VDOT to try connect the trails being constructed as part of the Route 50 widening project, that ended west of Route 28, with trails on the east side of 28. We were not successful in getting the project limits extended; the new policy provides incentive to make this type of connection in the future. Innovative bike designs: The policy also includes support for using non-standard bike facilities that are in use in other communities. 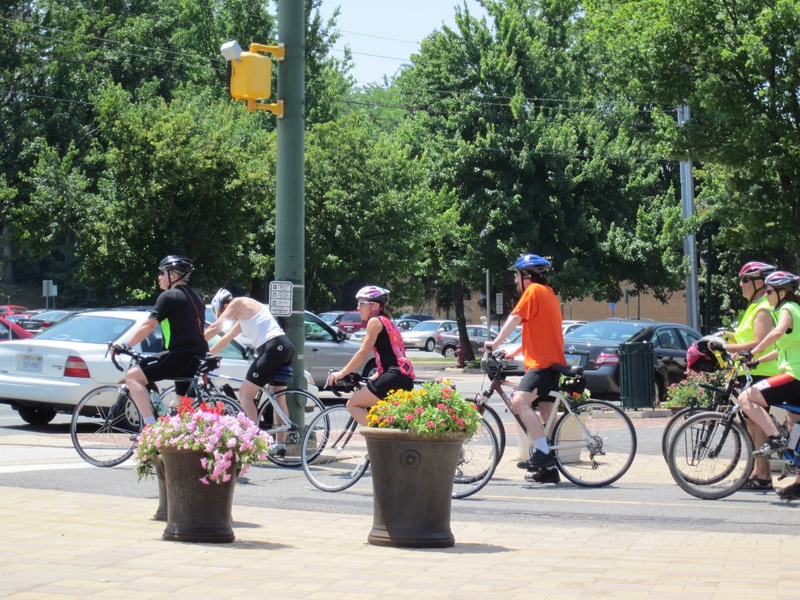 VDOT will study and, where appropriate, implement new types of bikeways that are being used effectively in other jurisdictions, including bike signals, bike boxes, cycle tracks, buffered bike lanes, contra-flow bike lanes, and bike boulevards, among others. VDOT should establish benchmarks needed for future tracking of bicycle-related implementation efforts and changes in ridership numbers over time. Measures that can be considered include the number of bikeway miles implemented, the number of bicycle crashes, the number of bicycle parking spaces, percentage of students bicycling to school, and other measures. VDOT should establish a long-term pedestrian and bicycle facility inventory and counting program, in coordination with towns and cities, Regional Planning Commissions, Planning District Commissions, and Metropolitan Planning Organizations. The plan contains lots of good information and it's worth spending some time read it. See page 36 for a summary of the recommendations. The Town of Herndon Town Council will hold a Public Hearing on the draft Metrorail Area Plan. The plan includes cycle tracks on Herndon Parkway. The plan was approved by the Herndon Planning Commission on Oct. 3. The meeting is on Tuesday, October 25th at 7:00 p.m., Ingram Council Chambers, 765 Lynn Street. Cyclists are encouraged to support the cycletrack plan. You can also submit comments online. Nicole Wynands, Reston resident and Bicycle Friendly America Program Specialist at the League of American Bicyclists, is one of the featured speakers at the Sustainable Reston Forum. Nicole also recently joined the Reston Pedestrian & Bicycling Advisory Committee. The forum is tomorrow, Sat. Oct. 21, at Reston Community Center at Hunter's Woods, from 3-5 p.m. She will be speaking about sustainable transportation, and bicycling is probably the most sustainable form of transportation other than walking. Registration is free. Police in Vienna, Virginia say they have recovered quite a few stolen bikes. But no one has come forward to claim them. The bikes have generally been found around town, recovered by an officer and then stored at Vienna Police Heaquarters. A recovery database for stolen bike exists, but police can’t track down the owners if they have not contacted police or registered the serial number. In such cases, the bike is placed into storage. According to Officer Barker, most of the bikes were picked up after someone reported an abandoned bike, so perhaps the operative word should be "abandoned" bikes rather than "stolen." I would guess most of the bikes are in poor condition. If the bikes are not claimed, they will be donated as required by law. 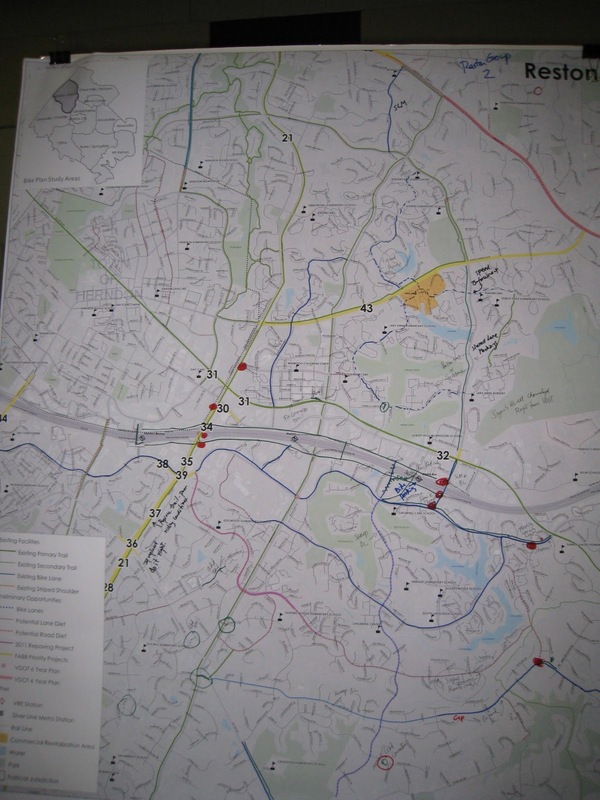 An enthusiastic group of around 35 people showed up for the Reston-Herndon area bike plan meeting last night. It was the second of eight planned meetings to gather input for the countywide bicycle master plan. The meeting started with a half hour open house that gave people a chance to connect with other cyclists and to talk to the planning team. Consultants from Toole Design Group gave a brief presentation on the plan and the purpose of the meeting. Participants split into several groups: Reston bike facilities, Herndon bike facilities, Educate/Encouragement/Enforcement, and Trails. Each group marked up maps and listed their ideas for making the area more bicycle-friendly. The Reston group marked dangerous intersections such as Wiehle Ave/Sunset Hills Rd, W&OD/Wiehle Ave, and several FFX Co Pkwy trail intersections. Bike lanes were suggested on Sunrise Valley Drive, South Lakes Dr, and on Lawyers Rd, extending the existing bike lanes, and signed bike routes were indicated on Village Rd, North Shore Dr, and Glade Dr. 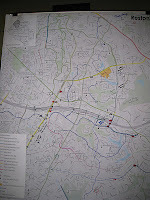 The information was collected by Toole and will used as input for developing the final county bicycle master plan. The next area meeting will cover the Mt. Vernon, Rose Hill, Ft. Belvoir, Mason Neck, and Huntington areas, on Thursday, Nov 17, 2011, from 5:30 – 8:00 p.m. at the South County Government Center, 8350 Richmond Hwy, Alexandria, VA in Conference Room 221 A-B, 2nd floor. Visit the project website for more information. Malcolm Kenton writes on GreaterGreaterWashington about a long bike trip he took that ends along Old Keene Mill Road headed toward the Franconia-Springfield Metro station. The road is like most arterial roads in Fairfax that carry heavy commuter traffic with no facilities for bicyclists or pedestrians. Experienced cyclists can ride on the road using proper riding techniques, but it's a daunting experience for most cyclists. As the Springfield area develops it's critical that better bike and per access be provided along this and the other major roads in the area. At the end of a long trail ride, my friend and I faced the daunting challenge of getting from Accotink Creek to the Franconia-Springfield Metro station by bicycle. We soon found out that Old Keene Mill Road in Springfield has a long way to go before it is fully accessible for all users. Sidewalks, at the very least, are needed. At its meeting today, the Fairfax County Board of Supervisors named Tom Biesiadny director of the Fairfax County Department of Transportation (FCDOT). He will assume his new position on Oct. 24. FCDOT provides public transportation services including the Fairfax Connector and other transit, highway, pedestrian and bicycle facilities and information for those who live, work, travel or do business in the county. It oversees projects including long-range transportation planning and funding and coordinates on regional initiatives, such as the Dulles Rail project. Biesiadny has worked for FCDOT since 1988 and is currently the department’s acting director. Prior to that he was chief of the Coordination and Funding Division. In that position, he coordinated between FCDOT and other state and regional transportation and air quality agencies. He also served as the county’s transportation lobbyist at the Virginia General Assembly, monitored federal legislation and chaired regional staff supporting the Northern Virginia Transportation Authority. He oversaw project funding through grants, legislation, bond issues and tax districts and negotiated agreements for funding transportation projects. Biesiadny also has been Fairfax County’s liaison to the Washington Metropolitan Area Transportation Authority (WMATA) and the Virginia Railway Express (VRE). His Fairfax County recognitions include the A. Heath Onthank Award (the highest honor Fairfax County bestows on its employees), a Transportation Advisory Commission Award and several outstanding performance awards. His prior FCDOT positions include chief of the Coordination and Funding Section; head of the Liaison and Contract Services Section; head of the Liaison and Technical Analysis Section; and a transportation planner. He began his career as a transportation planner with the city of Port Authur, Texas. Biesiadny received a bachelor’s degree in transportation, with a minor in management, from Parks College of Saint Louis University, Cahokia, Ill. He is a resident of Fairfax. His salary will be $147,270. TRAFFIC/INFRASTRUCTURE: Long term we need to be focused on modes of transportation other than cars. To that end, we must complete the Silver line to Dulles Airport and expand bus service on the HOT Lanes. Land use decisions need to consider public transit and pedestrian and/or bicycling routes. One simple solution for Braddock residents is to link the Burke VRE station to the over 75 miles of bike and pedestrian trails that exist within a 3-mile radius of the station. GROWTH: We need light rail, modern rail that is quieter than buses, and can travel 70 miles per hour on the beltway, on all major right-of-ways, like Little River Turnpike, Braddock Road, Route 50, rail along Columbia Pike. Greatly expanded rail should be accompanied by bike lanes, and pedestrian friendly communities. The new bike rental program that is so successful in Washington D.C. and Arlington must be expanded across Fairfax County. We need smarter, more intelligent choices for future development. TRAFFIC/INFRASTRUCTURE: There are four broad categories of critical infrastructure needs in Fairfax County School renovations, road construction and maintenance, storm water facilities, and a new public safety complex. There are additional needs for parks, libraries, trails, and other county buildings. You may recall that Supervisor Cook once said that "A bicycle is not a transportation device." 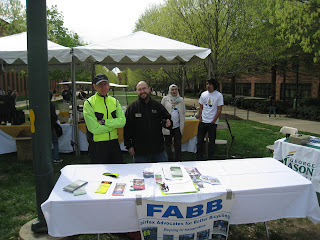 After making the statement FABB met with him to discuss the comment and the need for better biking in Fairfax. Since that time he held Braddock Bike Day and is working with residents of Burke to try to tame Burke Centre Parkway. About 15 people attended the meeting last night hosted by WABA to discuss bicycling in Fairfax. WABA is preparing a Regional Call to Action that will be unveiled at the Call to Action Summit to be held on November 3. Several good ideas emerged in the comments from the group. One common theme was the need for better education; of cyclists of all ages, motorists, and police. There are a lot of misconceptions about where cyclists should ride and how they should behave on the road. Residents have very few opportunities to get good bicycle safety education. It needs to be taught in the schools and the county could sponsor adult bike skills classes. Another way to spread this information is to include it in high school drivers ed courses, the VA drivers manual, and on DMV driver's license test. As you would expect, most people stated that we need more bike facilities; bike lanes, wider outside lanes, well-maintained paved trails, and better bike parking. On four-lane roads Charlie Strunk, the county bike coordinator, said that VDOT has recently agreed to narrow the inside lane on some roads and increase the width of the outside lane, giving more room for bicyclists. Fairfax should hold fun, community bike rides. We also discussed the possibility of holding a "civlovia" type event where a major road is closed to motorized traffic and bicyclists, pedestrians, runners, etc. can enjoy these public spaces for a change. All of the ideas were recorded by WABA volunteers and will be used as input to the Regional Call to Action. Thanks to Greg Billing of WABA who facilitated the discussion, and to the other WABA volunteers. A few FABB members took a brief tour of the Reston-Herndon area on Saturday in preparation for two meetings this week, the WABA Fairfax meeting tonight and the Reston-Herndon bike plan area meeting on Thursday. We started the tour at the Sunset Hills Park and Ride lot. Thanks to the efforts of the county bike coordinator, the bike parking at this new lot is the best example of good bike parking in Fairfax. There are 20 inverted U racks, spaced properly and conveniently located near the bus bays. 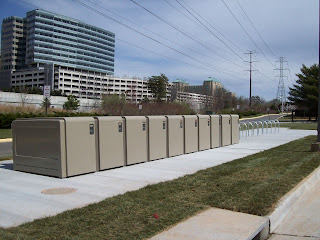 Next to the racks are a row of 20 weatherproof bike lockers. During the tour we reviewed current bike access to the three area Silver Line stations, Reston-Wiehle Ave, Reston-Town Center, and Herndon-Reston West. The Reston Metro Access Group report contains many recommended bike improvements for the two Reston stations, including bike lanes on Sunset Hills Rd, Sunrise Valley Dr, and Town Center Parkway leading to the station. We looked at possible locations for future trails on both sides of the Dulles Toll Rd that would allow easy access to the new stations and to the many businesses that will be located in the area. Parking lots occupy much of the space today, and as the area redevelops, a small amount of that space could be reserved for these trails. On the south side of the Toll Rd there are private service roads that would make good bike connections if the county could obtain easements. It will be imperative that good bike facilities be provided to link the most popular paved trail in Northern Virginia, the W&OD Trail, to the future stations. The connections should reduce conflicts with people walking to and from the stations. The W&OD Trail will also likely need to be widened in the near future. It is currently being used to capacity on most fair weather weekends and there are already many conflicts between cyclists traveling at different speeds, pedestrians, runners, and others. The road crossings on the Trail could be made safer by having raised crosswalks that force motorists to slow down. 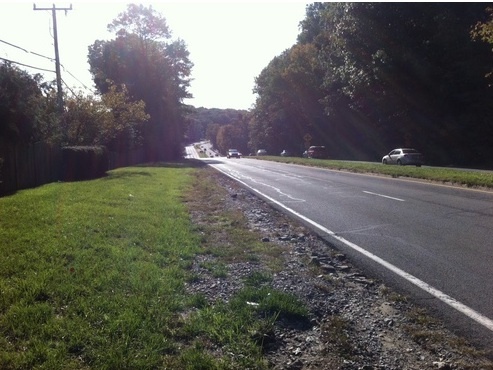 Where the W&OD Trail crosses Wiehle Ave near the Sunset Hills Rd intersection, not far from the future Reston-Wiehle Ave station, is one of the most dangerous locations in Fairfax for bicyclists and pedestrians. A bridge over, or tunnel under Wiehle Ave would be a major improvement. Prohibiting right on red at the Wiehle/Sunset Hills intersection would also help cyclists and pedestrians trying to reach the station. A bike box, which would allow bicyclists to cue up in front of traffic, would also help; it’s a short ride to the station entrance from Sunset Hills Rd. The last stop of the tour was the Herndon-Reston West station, current site of the Herndon-Monroe Park and Ride lot. This is another example of good bike parking, with several inverted U racks and bike lockers. Bikes on the roads approaching the station in the south, on Sunrise Valley Dr, and on the north, on Herndon Parkway, will provide good bicycle access to these stations. 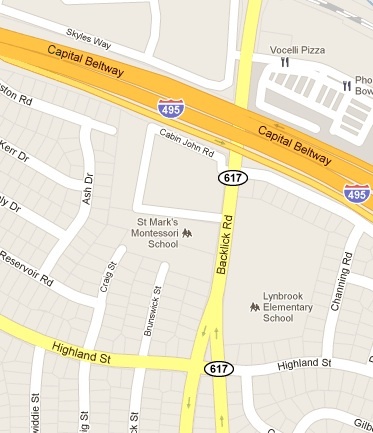 The Town of Herndon is even considering creating cycletracks on Herndon Parkway. The ride was a good chance to enjoy a beautiful Fall day seeing firsthand what bike access is like today, and envisioning a bike-friendly future. Tonight WABA is holding a meeting to hear what Fairfax bicyclists think should be done to make the county more bike-friendly. The meeting will be held at Patrick Henry Library in Vienna from 6:30-8:30pm. Feedback from the meeting will be used for the Regional Call to Action that WABA will announce at the regional bike summit on November 3. On Thursday, October 20 Fairfax County is holding a similar meeting. As part of the county bicycle planning process they are holding 8 regional meetings to gather input for the plan, which will be developed over the coming year. The Reston-Herndon area meeting will be held from 6:30-8:30 p.m., Sunrise Valley Elementary School, 10824 Cross School Road, Reston, VA 20191. See our Reston Patch article Making Fairfax More Bicycle-Friendly. County planners want to make Fairfax a more bicycle-friendly place. They want residents to have more choices for getting around rather than having to rely on cars for most of their trips. Using bicycles for short trips is a healthy transportation option and a proven way to relieve traffic congestion and reduce air pollution. It’s also an easy way to save money. The county is currently developing a bicycle master plan. The plan is structured around several major areas of emphasis, often referred to as the 5 E’s: Engineering (bike lanes, trails, bike racks), Education (bike safety classes in school, adult bike ed, motorist education), Encouragement (events such as Bike to Work Day to encourage more people to ride), Enforcement (for motorists and bicyclists), and Evaluation & Planning (counting bicyclists, tracking planning goals and milestones). f you’d like to help Fairfax become a more bike-friendly place, come out to Sunrise Valley Elementary School on Thursday evening and participate in the discussion. For more information about the planning process see the Bicycle Master Plan website. Two cyclists claim they saw a case of road rage this week on the George Washington Parkway. A driver in a gold Cadillac Seville caused an accident Sunday morning that seriously injured cyclist Phil Hepburn of Alexandria, and then fled the scene, said two of his cycling companions, Max Rogozinski of Woodbridge and Jim Strang of Fairfax County. "There was no doubt he was either trying to scare us and went too far or actually was doing it just to hurt someone," said Rogozinski. Hepburn was hospitalized after falling under the car, which pulled over and braked in front of him and four other cyclists, according to Rogozinski and Strang. In the fall, Hepburn fractured his hip socket and pelvis area, they said. Fairfax County Police spokesman Officer Bud Walker on Friday referred all questions about the case to the U.S. Park Police. A call to a U.S. Park Police spokesman was answered by a voice mail message that did not leave an after-hours phone number. A U.S. Park Police news blog does not mention the incident. "I've been cycling in the area for 40 years and I've seen some aggression, but never to this extent," said Strang, owner of Spokes Etc., a group of bicycle shops in Northern Virginia. We were contacted by a cyclist who crashed while riding on Backlick Rd near Highland St just south of I-495 in Springfield. The road is being repaved and there's a 2 to 3 inch ridge in the roadway. The cyclist was riding at night with lights and wasn't able to see the ridge and fell, fracturing his scapula and two ribs. This is a very dangerous situation, especially at night so be careful if riding in this location. VDOT begins work on the road diet project on Soapstone Dr on Monday, Oct. 17. The project will change the configuration of the road, between Glade Dr to Sunrise Valley Dr, from 4 regular travel lanes to 2 travel lanes and 2 bike lanes with a center turn lane. Work will begin on the southern-most segment of the road from south of Lawyers Rd to Glade Dr which is currently only 2 wide lanes. That configuration will not change. This project will link up with the new bike lanes on Lawyers Rd, giving cyclists from the south a very good route leading toward the new Reston-Wiehle Avenue station on the Silver Line. A big thank you to VDOT for having the vision to modify Soapstone and Lawyers, making both roads safer for everyone and creating dedicated bike facilities for cyclists. Vienna Police are looking for a female driver who allegedly hit a youth bicyclist on Maple Avenue and then fled. Police said Wednesday a white Honda Civic with Maryland license plates struck a juvenile bicyclist around 3:45 p.m. Sept. 29 at the intersection of Maple Avenue SE and the Washington and Old Dominion Trail. The crash left the bicyclist with only minor injuries, police said. The only description police have of the driver is she was a Hispanic woman. Any residents who have more information or may have witnessed the incident should contact MPO Sheeran at jsheeran@viennava.gov or 703-255-7826. 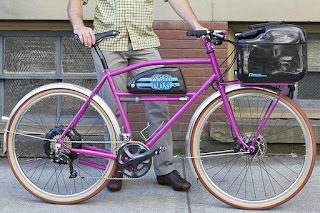 In a world of skyrocketing gas prices and diminishing oil reserves, the option of discarding the Range Rover in favor of a bicycle doesn't seem that ridiculous—especially if it is a bright magenta bicycle with an electric assist, a stereo and a lockable metal box. 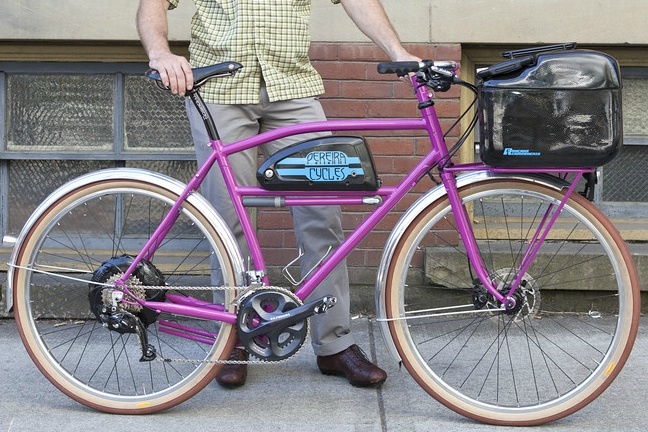 A bike fitting that description won the title of "ultimate modern utility bike" at last month's Oregon Manifest's national bicycle design competition and grueling 50-mile course. Presided over by judges including Nike innovation chief Tinker Hatfield (an Air Jordan designer), Breezer Bikes founder Joe Breeze, Design Within Reach head Rob Forbes and Bicycling magazine editor Bill Strickland, the challenge included hauling boxes and groceries over patches of gravel and up 3,000-foot-elevation hills to test their contraptions. The winner: that magenta model with a sound system (including an amplifier and speakers) fed from an iPhone that also serves as a navigation and communication device, and an electric assist battery for tough pedaling reprieves, by Portland, Ore., custom-bike builder Tony Pereira (see sidebar for other entries and details). 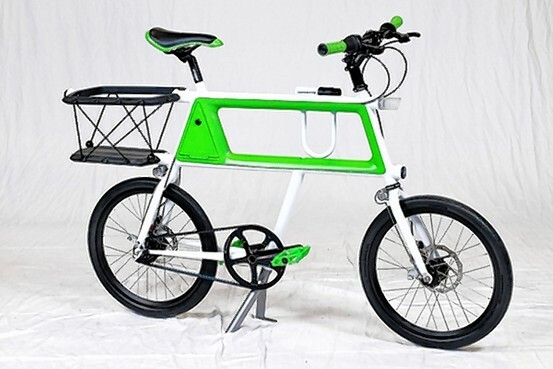 Second place went to a retro-looking bike that had an extended back topped by a seat with a leather cushion and handlebars and foot rests for the passenger, made by industrial designer Silas Beebe and bike builder Rob Tsunehiro. 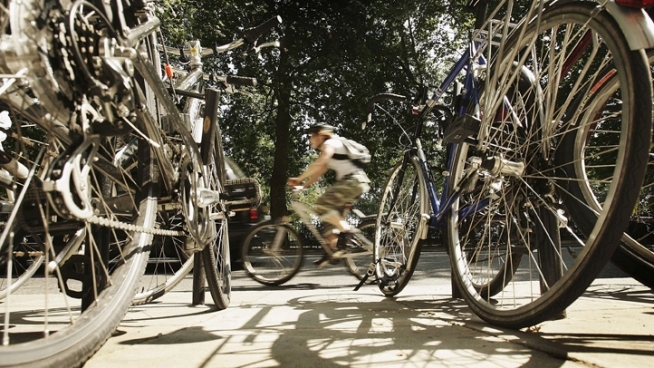 George Mason University was recently recognized for the many bike-friendly improvements they are making. The League of American Bicyclists awarded them the Bronze level of Bicycle Friendly University. Congratulations GMU! The Transportation, Sustainability, and Human Resources offices have worked hard to encourage more students, faculty, and staff to go by bike. It's a challenge given that many students also work full or part time and often travel longer distances than students at other campuses. GMU has held Bike to Mason Day for the past several years. This year they held regular Bike to Campus days coordinated by the bicycle program. The next event is scheduled for tomorrow Oct. 12. They are also holding bike classes and we'll be teaching a bicycle safety class as part of the bike to campus event. Staff can apply for the bicycle benefit and receive $20/month toward purchase of bike supplies and maintenance. Patriot Circle now has bike lanes or shared lane markings on most of the loop. Shared lane markings were recently striped on George Mason Blvd leading to campus. Covered bike parking with inverted U racks are available in many locations. Now the challenge is to get more students, faculty, and staff to consider using bikes for transportation. It's a slow culture shift, but it's happening. 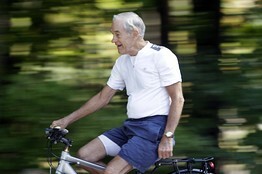 Clad in snappy white matching Pearl Izumi bikewear, Mr. Paul said he “dared” his GOP rivals to break from the campaign trail for time on the bike paths. There's a good chance the bike trail on which he was riding was funded by the Transportation Enhancement program, which Sen. Coburn recently tried to kill and which will be on the chopping block when the latest extension of the Transportation Bill expires in March 2012. Maybe Ron Paul can convince his son Rand Paul, who joined Coburn in speaking out against TE funding, that bike facilities are a critical part of our transportation infrastructure. The first of eight area meetings to gather feedback from cyclists for the county bike plan was held yesterday afternoon in Clifton. Bob Patten of Toole Design Group discussed the goals of the plan and marked up a map of the area based on comments for cyclists in attendance. Many people were concerned about safety of cyclists on the narrow, hilly roads that have no shoulders. Patten discussed the possible use of flashing lights on key parts of the steep roads that could warn motorists of cyclists ahead. Other options include the use of Bicycles May Use Full Lane signs and Shared Lane Markings. Someone suggested a Rail-with-Trail on the train line from Clifton to Burke. Another suggestion was to create short paved turnouts for cyclists on some roads that could be used to allow motorists to pass. The Reston-Herndon area meeting will be held on October 20 at Sunrise Valley Elementary School from 6:30-8:30pm. See the bike plan website schedule page for details. We rode to the meeting from Reston, using the Lawyers Rd bike lanes, neighborhood streets to the trail along Fairfax Co Parkway to the Braddock Rd trail to Colchester Rd to Neuman Rd to Clifton Rd. The trails along the Parkway and Braddock Rd were in terrible condition with overhanging vegetation and glass in many spots. We had two flat tires, in part because our tires are getting worn and should have been changed a while ago. However, it's inexcusable that the county has no funding for trail maintenance, which has been the case for many years. That's another reason for riding in the road when possible; the roads get swept of debris by cars. Once we arrived, it was good to see that two inverted U racks were available for bike parking. As we were leaving the meeting we encountered a cross-country cyclist. Earlier this year he left his home in Nebraska, cycled to and along the West Coast, then across the country and is now headed south. He'll return home later this year. He was amazed at the amount of traffic on the narrow country roads leading to Clifton. He was headed for Bull Run Park to camp for the night but decided to stop for a bite to eat in Clifton to wait for the traffic diminish. Walk and Bike to School Day in Fairfax was a great success. This is the first year the event was held and over 20 schools participated. Vienna Patch has an extensive article about the event: Video and Photos: Walk To School Day In Vienna; Hundreds of students turn out for international awareness day. "In 1969, 60 percent of children bike or walked to school. Today, only 13 percent," said Anderson, who began Wolfie's Bike Train and continues to lead it. "It's another tree in the forest of things we're trying to reinstill in our children ... namely a healthy lifestyle, eating well, getting out and walking." At Kilmer Middle School — which received a new set of bike racks for its growing population of student bike commuters last June — school staff ran out of the "tickets" they gave to each child that walked or biked to school. The students wrote their name on the ticket and hung it on a banner, in exchange for a granola bar and a bottle of water. "We have a lot of students that just get dropped off by their parents and they live close enough to walk or ride," said Kilmer Middle School employee Brian Herberger. "It seemed like we should encourage them to get some fresh air and get some exercise." For Vienna Elementary School, this year's International Walk To School Day kicked off a new program called "Walking Wednesdays," a day that will encourage students to walk to class every week. Caffe Amouri donated coffee to parents who dropped their kids off on foot. If you're wondering why there's a new look to the FABB blog, join the club. I was just editing the blog template when suddenly this new template appeared. I'm working on reverting back to the regular template with links to other sections of the FABB website. Update: We've managed to restore the regular blogger template but it's not a good sign that the new template appeared without our knowledge. It's a flashy website without much content. The site is obviously a work in progress. Under Planning>Assessments, Bikability Assessments are "coming soon." Under Exploring>Products & Services the only item listed under Education is a bike safety skills DVD for sale by Disney. Under Learning>News & Articles there's a blog-like feature with some current news but no dates for the entries are listed. We'll see how the site develops. In the meantime the FABB Cyclists Resources page contains an extensive collection of resources for area cyclists. At the final meeting of Tysons Metrorail Station Access Management Study team, results of their online survey were presented. 1,896 people completed the survey which included the following question: "If going to a new Tysons Corner Metrorail station, how do you plan to travel to the station?" The responses included 45% plan to walk, 37% plan to bike, 33% plan to ride the bus, and 33% plan to use kiss and ride. The Tysons Bicycle Master Plan was completed in February and is awaiting approval by the Planning Commission and Board of Supervisors. The plan includes many recommendations for improving bicycle access to the stations. The plan needs to be approved and work needs to begin on implementing the plan so that when the stations open, bicyclists have safe, convenient ways to reach the stations. With no permanent car parking planned, adequate bike parking is critical. Final recommendations for sidewalk, trail, bicycle, and transit improvements were discussed. The bicycle plan contains the bicycle recommendations. There was some overlap between the sidewalk and trail recommendations. The highest priority sidewalk and trail recommendation was a new trail from the neighborhood southwest of the Tysons-Spring Hill Road (formerly Tysons West) station from Vesper Lane to Route 7 and Spring Hill Rd. The .4 mile trail would lead almost directly to the station and provide access for bicyclists from the W&OD Trail and Vienna area. The final report should be completed in the next week or two and will be available on the TMSAMS website. GGW published an article we wrote on walking and biking to school, Reducing school traffic would help rush hour congestion. International Walk and Bike to School Day is tomorrow and it's worth pondering what rush hour traffic would be like if most kids used the form of transportation recommended by the schools instead of having parents drive them. Not only would it relieve rush hour traffic, kids would get more exercise and learn they don't always need to use a car to get around. The article generated a number of thoughtful comments. Mark Blacknell, chairman of the Arlington Bicycle Advisory Committee, reported on the Arlington Call to Action meeting held last week: Getting Our Priorities Straight. The meeting is one of several organized by WABA for the Regional Call to Action report, to be completed and released at the Call to Action Summit on November 3. The Fairfax meeting is planned for Monday, October 17 from 6:30-8:30pm at Patrick Henry Library, 101 Maple Avenue East, Vienna, VA 22180, located about a block from the W&OD Trail. See our earlier post about the regional meetings and the summit. Cyclists should be thinking about short, medium, and long term goals for making Fairfax more bike-friendly. If you can't attend the meeting fill out the one page PDF planning sheet and send it to advocacy@waba.org. Tuesday: Car-free access to Tysons Metro stations (otherwise known as the Tysons Metrorail Station Access Management Study) - The final public meeting of TMSAMS on "What was Learned Through the TMSAMS Public Involvement Process" will be held from 7 p.m. – 9 p.m. at Freedom Hill Elementary School, 1945 Lord Fairfax Road, Vienna, VA 22182. Wednesday: Walk and Bike to School Day - It looks like it will be a great day for International Walk and Bike to School Day on Wed. The forecast is for a mild, sunny day. Several schools are planning events to celebrate walking and biking to school. See our blog post about the event. Thursday: Greater Clifton Area Bike Plan meeting - The first of eight public meetings to gather information from local cyclists about what is needed to make Fairfax more bicycle-friendly. 4-7 p.m. at Clifton Town Hall, 12645 Chapel Road, Clifton, VA 20124. 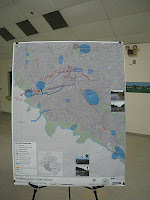 See the bike plan website for more info about the planning process. The Reston-Herndon meeting is scheduled for Oct. 20. Over the past year, interested parents, citizens and representatives of Fairfax Advocates for Better Bicycling (FABB), Washington Area Bicycling Association (WABA) and Trails for Youth have been meeting with leaders from Fairfax County Public Schools (FCPS), the Fairfax County Board of Supervisors, the FCPS School Board, the FCCPTA and the Fairfax County Education Coalition (FEC) to encourage FCPS to address the decline in children walking and biking to school. As a result of these meetings FCPS is embracing a system wide promotion of International Walk to School Day on October 5, 2011. Students in Fairfax County public schools will participate in International Walk to School Day in an effort to promote physical activity and reduce traffic congestion and pollution near schools. All students at all school levels are encouraged to walk or bike to school or walk to their bus stop on October 5. Parents are encouraged to accompany their children to school and to work with their school and PTA or PTO to assemble walking groups for the event. Schools that want to participate can register online at the Walk to School website. We need your assistance in getting the word out so that local schools can join with the 6 that have already signed up and started their planning for International Walk to School Day. In addition, the FCCPTA passed a resolution earlier this year in support of Safe Routes to School. In 1969, approximately 50% of children walked or bicycled to school and 87% of children living within one mile of school did. Today, fewer than 15% of school children walk or bicycle to school. As a result, kids today are less active, less independent, and less healthy. So as to better understand how to find solutions to this 35% decrease, FCPS has created a Safe Routes to School working group made up of FCPS and County employees, members of the community from the groups mentioned and the Fairfax County Police Department. 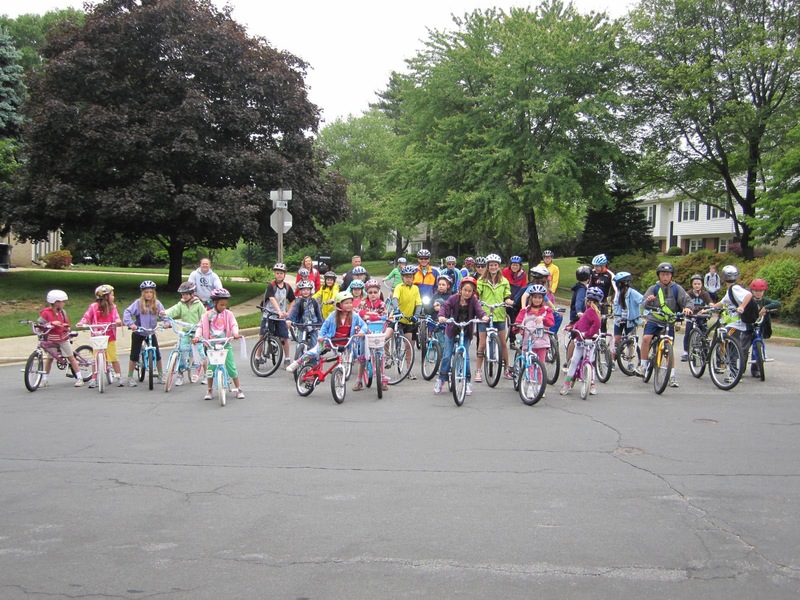 Wolftrap Elementary School and Vienna Elementary School are two of several Fairfax County public schools to establish a Safe Routes to School program and participate in bike and walk to school initiatives. Wolftrap began its program with general bike and walking education for all students, moved its Kiss and Ride drop off and pick up spots in order to separate automobile traffic from pedestrian traffic and established a monthly run Wolfie's bike train where students bike to school together when weather permits. Vienna is embarking on a plan to create Walking Wednesdays and has applied for a grant to install missing sidewalks along many of its walking routes. 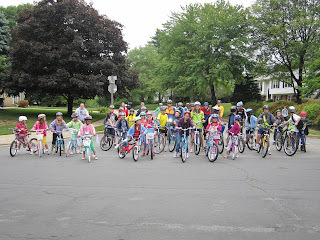 Both combined efforts with Cunningham Park Elementary School in May 2011 to have a Bike and Walk to School Challenge between the three schools. Over the course of the week 400 children biked and 2100 walked to school and each school saw KissNRide drop off near 50%. Several public officials joined in during the week and some shared their perspective on walking to school. 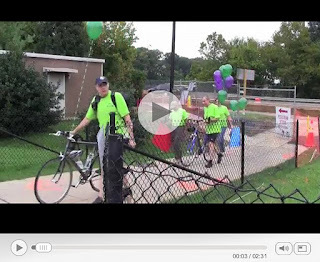 In addition, you can read about how the installation of a bridge near Kilmer Middle School ultimately led to more bikers and their PTA installing a rack. For more information, read up on Safe Routes on the FABB site or see the FCPS Walk to School site and Fairfax SRTS Facebook page or contact srts@fabb-bikes.org. See the Walk and Bike to School Day flier that can be printed out and posted or handed out at your school.